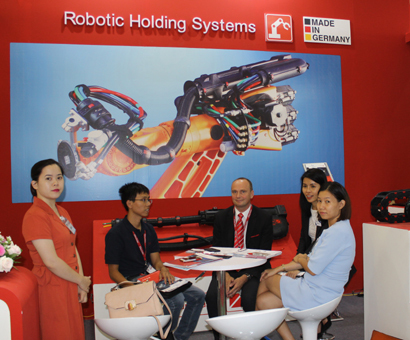 On the occasion of Vietnam Manufacturing Expo 2018 (VME) held in August in Hanoi, Vietnam Business Forum magazine of Vietnam Chamber of Commerce and Industry (VCCI) conducted an interview with Mr. Gerd Nothdurft, CEO of Murrplastik, to share his views of development opportunities in Vietnam’s manufacturing industry and Murrplastik’s development plan. Nam Pham reports. What do you think about perspectives of Vietnam’s industrial production and the country’s position in ASEAN’s manufacturing industry? Vietnam’s industrial production plays a more and more important role in the ASEAN’s manufacturing industry nowadays and achievements of Vietnam’s trade are also very impressive. The country is seeing very good opportunities to attract huge investment in the manufacturing industry. Rising costs in some of the neighboring countries like China appear to be an opportunity for Vietnam to attract foreign investment. Murrplastik Asia will take German advanced technologies and high quality products to Vietnam and strengthen the competitiveness of domestic manufacturers. Can you give a brief about Murrplastik Asia Co. Ltd.
Murrplastik Systemtechnik GmbH has been one of the pioneers in the fields of professional cable management and high-tech plastic products since 1963 with over 200 patents. We offer solutions to the challenges in the fields of energy chains, cable entry systems, conduit and fitting systems, labeling systems and robot dresspack. We are the only provider, who have these different products in the portfolio. Our products can be found in many industry sectors such as automotive, control cabinet construction, mechanical engineering, railway engineering, robotics and automation. The industrial development of Vietnam market is rapid these years, we would like to come into this new market and grow with it. What is your point of view about the smart factory as the future of manufacturing, which is a part of Industrial Revolution 4.0? Industrial Revolution 4.0 is very popular which will launch a new industrial revolution. Murrplastik has also thrown itself into it. Many of our products are related to internet which enables our products to be more effective and user-friendly. 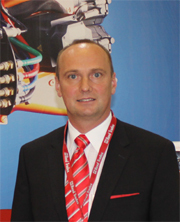 We have a lot of solutions we can produce “on demand” – such as label or cable entry on demand. We also develop printer to integrate them into the system of our clients. What do you think about attending Vietnam Manufacturing Expo 2018? What are key products which Murrplastik Asia Co. Ltd will present at VME 2018 and its highlights? This is our first time to attend this exhibition. The organizer is very helpful and we are confident this exhibition will benefit us. VME is a good well-known platform for our foreign company to learn your market and show ourselves. We hope we could find the right customers here and increase our brand awareness. Cable Chain: Murrplastik energy chains are used wherever a permanent linear and movable guide for lines and conduit in a variety of designs may be required. With the help of “on line chain builder“, technician will make selections much more precisely and easier. Cable Entry Plate: Murrplastik always focuses on system design. It is a well-known problem for everyone working with control cabinets, enclosures and pre-assembled cables with connectors which need to be fed in. One of the greatest advantages of Murrplastik products is their small space requirements, because of the great packing density as well as their user-friendliness. We can offer a lot of certificated standard products, but we also can deliver specific, customized solutions for our clients. Robot Dresspack: Well-thought-out Murrplastik components provide robots with necessary freedom for high-speed work movements and precise repetitive task completion. We offer innovative system solutions, design, development and prototyping, optimization and documentation. Can you share the marketing plan of Murrplastik Asia Co. Ltd in the next three years? With the strong development opportunities in the Vietnamese market, Murrplastik Asia will closely cooperate with the local partner, IWISU Engineering Trading Co., Ltd, to develop this market over the next three years. We will focus on observing and analyzing this market carefully and develop the special made products for this market and introduce the most advanced technologies from Germany to serve the market. Despite competitions from the same products made in other countries like Korea, China and others, we strongly believe in Vietnam’s market where Murrplastik products will meet wide-ranged demands of customers thanks to their flexibility, efficiency, profitability, service and consulting competence. In addition, we will increase the number of well- trained employees to work for us, strengthen our technical support and increase the customer services.